Molecular targeting of tumor hypoxia is a promising strategy for improving the radiotherapy of cervical cancer. A biomarker for classifying patients according to hypoxia is, however, lacking and is an important requirement for reliable drug evaluation and to avoid added toxicity to patients with no expected benefit. 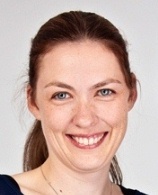 In a study published in Clinical Cancer Research (journal impact factor 8.7), postdoc Christina S. Fjeldbo (photo) in Lyng’s group and colleagues at Oslo University Hospital and Aarhus University Hospital present a hypoxia classifier that is reflected in diagnostic DCE-MR images and based on the expression level of six genes in a biopsy. The classifier may give an early indication of a patient’s risk of hypoxia-related recurrence, and provide biological information to aid the choice of drug for combination trials with radiation. In addition, the study demonstrates a direct link between genomics and imaging that might facilitate implementation of a multifactorial tool for a more precise response prediction. The paper was selected for “Highlights of the issue”. The study is part of an ongoing collaboration between the Clinical Radiation Biology group at Department of Radiation Biology and the Departments of Medical Physics and Gynecologic Oncology at Oslo University Hospital. Integrative Analysis of DCE-MRI and Gene Expression Profiles in Construction of a Gene Classifier for Assessment of Hypoxia-Related Risk of Chemoradiotherapy Failure in Cervical Cancer. Fjeldbo CS, Julin CH, Lando M, Forsberg MF, Aarnes EK, Alsner J, Kristensen GB, Malinen E, Lyng H.
Clin Cancer Res. 2016 Aug 15;22(16):4067-76. doi: 10.1158/1078-0432.CCR-15-2322. Epub 2016 Mar 24.